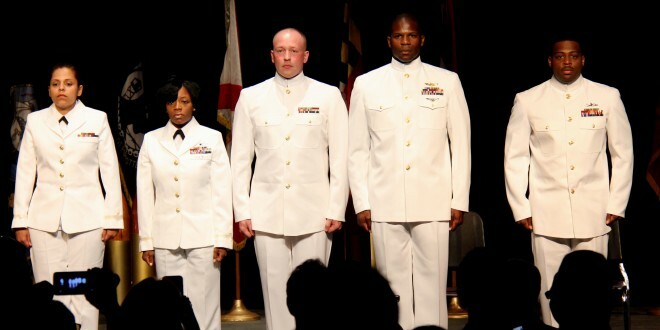 From left, Ensign Damaris Parrilla-Fernandez, Ensign Shannon Myers, Ensign Wesley Limberg, Ensign Julius Jones and Ensign Robert Todd Brown at the JU MECP Commissioning Ceremony April 25. They’re a unique cohort of students at Jacksonville University, entering eager to learn all they can in their chosen subject and leaving not only with their bachelor’s degree but as officers in the U.S. military, proud alumni of one of the largest university units of its kind in the country. No, they’re not part of JU’s vaunted Naval Reserve Officer Training Corps (NROTC) program, which has produced more than 1,500 commissioned officers and numerous commanders since becoming the first such unit in Florida more than four decades ago. Ensign Julius Jones with his wife, mother and two sons at the JU MECP Commissioning Ceremony April 25. They’re part of the Medical Enlisted Commissioning Program (MECP) at JU, which offers qualified active-duty enlisted sailors and marines a chance to earn an entry-level nursing degree followed by an appointment as an ensign in the U.S. Navy Nurse Corps. Participants receive full pay and benefits of their pay grades while pursuing their Bachelor of Science in Nursing (BSN), and can use their Montgomery G.I. Bill and other financial assistance to pay for schooling. Last year, about 45 active-duty personnel were accepted into the highly selective MECP program nationwide, and a dozen chose JU to further their educations. In fact, of the approximately 125 students overall in the program nationwide currently, JU has 31, a high number for a single institution. According to Stephanie Bloom, Director of Admissions & Enrollment for JU’s College of Health Sciences, the MECP program at JU is so popular because of the campus’ great reputation for being very military-friendly; great support resources for active-duty students; proximity to Navy bases; high program quality; high Licensure (NCLEX) pass rates; and JU’s Critical Care focus being very desirable for students, particularly those who want to get into a trauma or critical care environment after graduation. 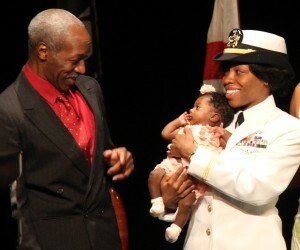 Ensign Shannon Myers with daughter Samiya Hunter and Shannon’s father at the JU MECP Commissioning Ceremony April 25. Dating back to the program’s beginnings at JU in 2005, numerous MECP students have gone on to stations all over the world serving as Navy nurses, including at large Navy base hospitals such as Balboa Naval Hospital in San Diego; Walter Reed National Military Medical Center in Bethesda, Md. ; and Naval Hospital at NAS Jacksonville. This year, five students graduated from the program April 25 with their BSNs and were commissioned, along with one graduate from the Seaman to Admiral-21 (STA-21) Commissioning Program. Commissioned through the MECP program were Ensign Damaris Parrilla-Fernandez, Ensign Shannon Myers, Ensign Wesley Limberg, Ensign Julius Jones and Ensign Robert Todd Brown. 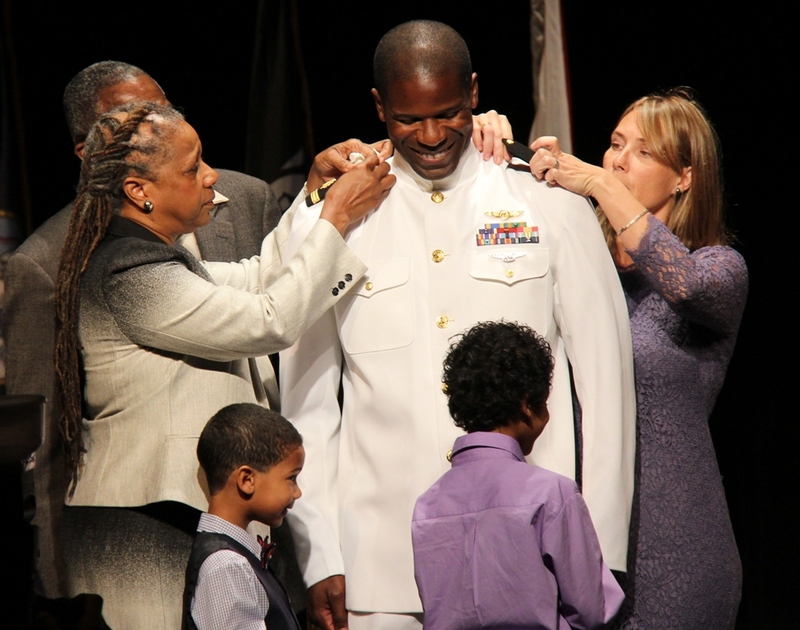 Additionally, Lisa Bruscato was commissioned an Ensign as part of the Navy’s STA 21 program. JU has one of the largest active MECP student groups in the country, and this fall will boast 31 active MECP students in the School of Nursing’s BSN program (one of those is 17-year Navy veteran Brian Holcomb, who turns 35 next week and is being celebrated nationwide for becoming the oldest starter in NCAA history after pitching for the JU Dolphins April 28). Selectees for the program must participate in a nationally accredited academic program leading to a bachelor’s degree in nursing. If eligible, they may use the Veterans Educational Assistance Program (VEAP) or Montgomery Government Issue Bill (MGIB) educational benefits (click here). Graduates incur an 8-year military service obligation, of which a minimum of 4 years must be served on active duty. Eligibility requirements include a recommendation by an applicant’s Commanding Officer; service on active duty in the U.S. Navy, U.S. Marine Corps or U.S. Navy Reserve; and ability to complete the nursing degree requirements and be commissioned before age 42. For more on the MECP program, click here. To apply to the JU School of Nursing, contact Stephanie Bloom at slbloom@ju.edu.